Born on April 12, 1878 in Philadelphia, Pennsylvania as Lionel Herbert Blythe. 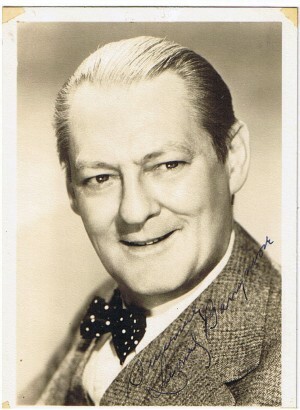 He was the oldest child of stage perfomer Maurice Blythe who had gained fame as Maurice Barrymore and his wife Georgina Drew the daughter of celebrated actor John Drew. Lionel along with his sister Ethel and brother John, all aspired for careers away from the stage but were all forced into the family vocation. They were afforded a private education but put onto the stage at an early age. Lionel’s appearance lent him a maturity beyond his years and he invested wholeheartedly into any character he played. His own father cast him in roles as his brother’s father even though Lionel and John were only separated by 4 years. He launched his film career in 1911 in New York, which allowed him to work on the stage and in film productions. He appeared in over 85 silent films from the time of his first role in 1911 to the invention of talkies in 1929. After signing a contract with MGM in 1926, he left the New York stage for good to relocate to Culver City, California. He ultimately spent over a quarter of a century under contract to MGM, lending his talents to over 100 films. He also brought Ethel and John to MGM and the brother teamed in films such as Grand Hotel, Dinner at Eight, and Arsene Lupin. His performance in A Free Soul (1931) with Clark Gable earned him an Oscar. His leading ladies included such screen legends as Joan Crawford, Greta Garbo, Norma Shearer, and Shirley Temple. 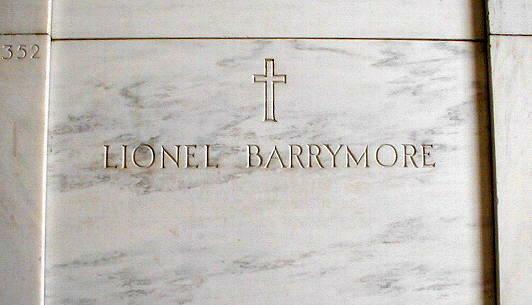 Despite a good time in the Roaring Twenties, Barrymore’s life and losses left him a sober member of the Hollywood community. Outside of it he immersed himself in painting and engraving. He also wrote a biography about the family titled We Barrymores. Twice married, Lionel’s second wife Irene Fenwick died on Christmas Eve 1936 the year before he began his annual tradtion of playing Scrooge in A Christmas Carol, a tradition he carried out with Orson Welles and the Mercury Theater players. Lionel never remarried, and he suffered a fatal heart attack on November 15, 1954 in Van Nuys, California. 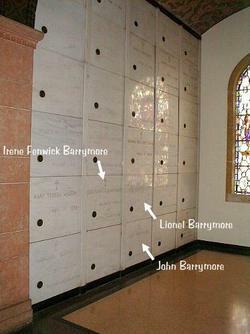 He was buried beside his second wife Irene Fenwick and brother John (who was later relocated) at Calvary Cemetery in East Los Angeles, California.